This Houdini Lever Corkscrew with Foil Cutter and Extra Spiral (Velvet Black) is the perfect accessory for beverages with friends at dinner, on the patio, or in the living room. 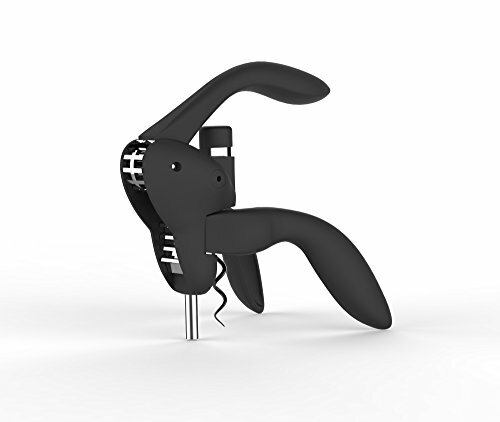 Open wine bottles quickly and effortlessly with this innovative corkscrew design. Simply push the corkscrew down onto the bottle and pull up, removing the cork. Push down and pull up again to disengage the cork from the corkscrew. Tested for 20,000 cork pulls by an independent laboratory, this corkscrew is made with hardened metal gears to withstand years of use. Great as a gift for any wine lover, this corkscrew comes with an extra spiral and matching foil cutter. Open wine bottles quickly and effortlessly with this innovative corkscrew design. Simply push the corkscrew down onto the bottle and pull up, removing the cork. Push down and pull up again to disengage the cork from the corkscrew. Tested for 20,000 cork pulls by an independent laboratory, this corkscrew is made with hardened metal gears to withstand years of use. Great as a gift for any wine lover, this corkscrew comes with an extra spiral and matching foil cutter. If you have any questions about this product by Houdini, contact us by completing and submitting the form below. If you are looking for a specif part number, please include it with your message.